I was going to be attending a conference (BlogFest!) in San Diego and didn’t want to drive so I googled “Los Angeles to San Diego transit” fully intending on taking the train but not being so excited about it since it’s not the timeliest mode of transportation. Thankfully, I saw an ad for this thing called Tesloop while I was doing my research and thought I’d check it out and I’m so glad I did! Such a simple search phrase but it got a great result! Their booking tool is very simple – you enter your start, destination and dates of travel. They’ll find a meeting spot closest to your starting point. At the time of my booking, they did not offer ‘home’ pick up, but the closest spot to me was about 15 minutes away. There were a few time options for my travel day, with different options for pick up. When I settled on the one I thought was best suited, it led me through a standard booking process. And ta-da – I had my ride to SD! When I booked in April (yes, I plan ahead), you could pick a specific seat and the price was based on this – front seat was most expensive, the third-row seat was cheapest. They don’t do it this way anymore and don’t book the third row. I couldn’t book my return trip at the same time – it was outside of their booking window. This worked out better, as I got a promo code in my “welcome” email and applied that to my second booking. The day prior, you get a reminder email, with the important trip details and showing the route based on the passenger pickups and destinations. The map doesn’t show you which stops are pickups and which are drop offs. That is also the only indication of how many people are booked in your car. I say might, because in theory there could be multiple people at one stop. The day of the trip, you will get texts from their “command center” that is tracking the driver and will provide the name of your driver and phone number in case you need to get ahold of them directly. You can also contact the command center for any problems, even en route. They also provide updates on when the driver will arrive at your destination. I was the first pick up, so the driver arrived right on time (and I found during my ride, there is plenty of time built into the schedule, so drivers are more likely to be early than late). It was clear when the Tesloop pulled in – a bright red, shiny Model X with Tesloop branding on it. I met Michael (confirm! ), got my luggage situated, and found my seat. Like I mentioned earlier, the seating is no longer ‘assigned’ and the third row is no longer considered a seat, but I picked my original booked seat. Each seat had a phone charger (with pretty much every adapter possible! ), and you could request headphones or neck pillows to borrow and there was a snack/water cooler with goodies for the road. We got on our way for the second pick up, and that is where I was really sold on the service side of Tesloop. Our second passenger was arriving at LAX and his pickup spot was just north of the airport in a popular shopping center. Unfortunately, his flight arrived late so he got in touch with our driver directly and let him know the situation. Instead of just shrugging and saying “too bad” about potentially missing the pickup window, we went to the airport and picked up the passenger. We had arrived at his pickup spot plenty early, so this didn’t add any more time to the trip, totally made the guys day, and made me a fan. Our third pick up was uneventful and then we really got on our way. I had planned on getting some work done on the ride down, but the group was social so although I had my laptop out, I didn’t get much accomplished. We learned a lot about Tesloop as a company, the competitive scene at the electric charger in San Diego, and a little bit about my fellow passengers. At one point, we asked what the most memorable ride was, and while the details of the particular ride aren’t important, it did result in some changed policies for passenger comfort. It impressed me to see that the company is really about the passenger experience, and they’re constantly working to improve. Soon enough it was time for drop-offs to start, and my Tesloop ride came to an end. Not long after the drop-off, I got a text from the driver with a photo, asking if the headphones in the picture were mine! Apparently, I had left them on the seat (gah!) and he offered to have them sent back to me. Even better, he was able to find out which car I would be taking back to LA and got them into the lost & found box in the car, and they were waiting on my seat at pick up! For the return trip, I was the last passenger to be picked up and had gotten a text from the command center about a delay in pickup. This ride was much less-social, so I had a few hours to zone out. We did have to make a brief stop to do a little charging, but it was pretty short, and we had the option to get out and grab a coffee if wanted. My drop-off was slightly delayed due to the delayed pick up, but otherwise, the ride back to LA was just as wonderful as the ride down. If you are in a HURRY, I would not use Tesloop. I was the first pick up and found out that each pick up is booked with a comfortable buffer. It’s great if the driver runs into traffic, the schedule doesn’t get behind, but unless you’re the last pick up and first drop off there will be some “lag” time, but it is built into the estimate on when you’ll arrive. My schedule was flexible, so it worked out great! There is wi-fi on board, but it’s not very strong. I wasn’t going to stream video or anything like that, but even loading some web pages struggled. There are a few long stretches on the route where my cell service drops completely so the wifi would have been nice. I was trying to stay on top of work emails, otherwise, I would have welcomed the disconnect! 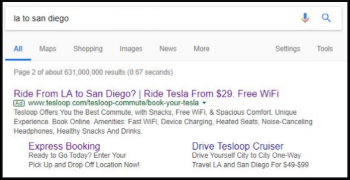 Tesloop is NOT related to Tesla Motors other than the fact they use Tesla vehicles. If you require lots of bathroom breaks (or snack stops), are traveling with car seats, or aren’t very flexible in arrival times, this might not be the service for you. If you require a lot of luggage, this also might not be the service for you. Their luggage policy is generous, but something to keep in mind. I highly recommend at least checking out Tesloop if you're going to be traveling between LA and San Diego (or Palm Springs or the OC). And definitely check out their FAQ section for your burning questions. Have you used Tesloop? I'd love to hear your experience, or if you plan on trying it out, let me know too!